Hello! One of my all-time favorite things to make before I transitioned to a plant based diet, was shepherds pie. I made it once in culinary class while I was in High School and I have been hooked ever since. Traditional Shepherd's pie has lamb or beef in it and is usually topped with cheese. So, obviously, this would not work with my new lifestyle. The other day I was really craving shepherd's pie, this inspired me to come up with a recipe that would be vegan. I also thought it would be fun to compose the shepherd's pie in a potato kind of like a twice baked potato. This works out super well if you ar not cooking for enough people to make an entire casserole dish. This Shepherd's Pie is also very cost efficient. I paid $0.65 per serving for this dish. The lentils will give the dish a meat like texture and will be similar to the traditional dish. If you are looking for a cheap and delicious meal to make this is the recipe for you! Did you try this recipe? Do you hate it? Do you love it? Have a request for another recipe you would like us to try? Leave it in the comments! 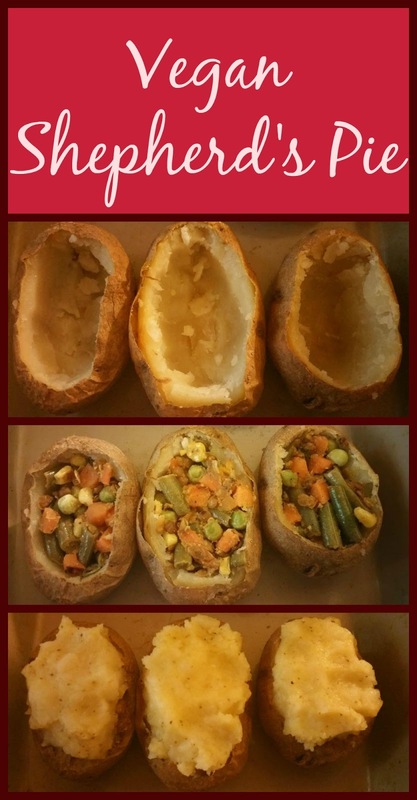 I love the idea of the shepherd's pie being stuffed inside a potato! I bet kids love it! This is a cute recipe - I love these stuffed potatoes! I wonder if they would freeze well too?! Such comfort food. Perfect for these cold weather days. And love your creative use of the potato!